Insulating cold process soap keeps temperatures warm while the soap hardens in the mold. The primary reason for insulating cold process soap is to promote gel phase. The term “gel phase” refers to a part of the saponifacation process where the soap becomes very warm in the mold – up to 180 ° F. Gelled soap also has a more translucent, shiny look than non-gelled soap. 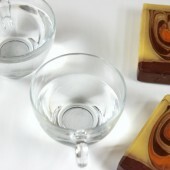 Gel phase is purely an aesthetic quality, and does not affect the quality of the soap. Click here to read more about gel phase, including photo examples. 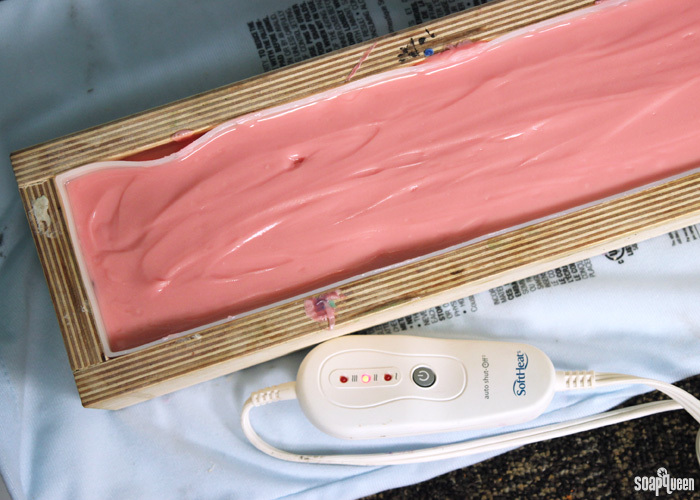 To ensure the soap goes through a complete gel phase, we like to place our soap on a heating pad for about 20 minutes on low/medium heat in addition to insulating. The hottest part of the soap is the center, and the heating pad gives the soap an extra heat boost that helps the entire soap (not just the center) reach gel phase. 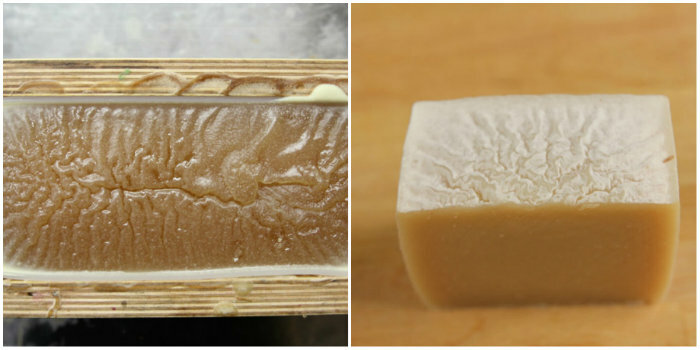 Below, are photos of a soap that was placed on a heating pad and covered with cardboard for about 20 minutes. You can see it’s going through a nice and hot gel phase! I like to gel the majority of my projects. The heat from gel phase really helps colors to pop. This is especially true for LabColors. If working with LabColors, I thoroughly recommend insulating your cold process soap with a lid and blanket to promote gel phase. 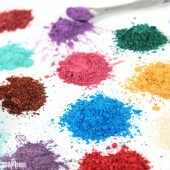 Of course colors are a personal preference, but gel phase helps the LabColors to look bright and vibrant. Click here to read more about LabColors and gel phase in this blog post. Above is cold process soap that has gone through gel phase, notice the bright colors. Click here to learn more! 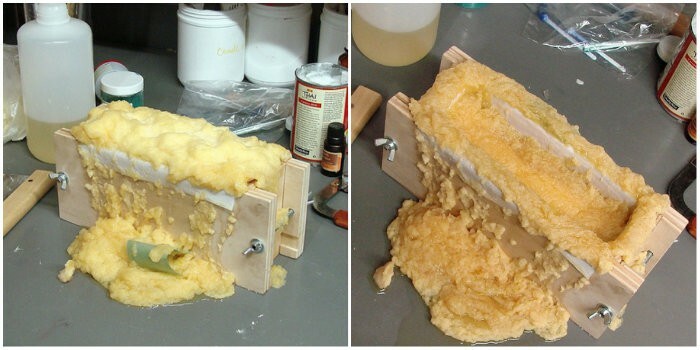 If you want your soap to go through gel phase, insulating is important. But, why else would you insulate cold process soap? 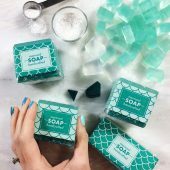 Insulating cold process soap prevents soda ash from forming on the surface of your soap. Soda ash forms when unsaponified lye reacts with naturally occurring carbon dioxide in the air. 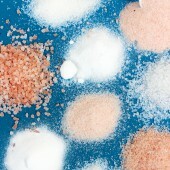 Soda ash is completely harmless, but is an aesthetic issue. Soda ash usually occurs when soaping cold, when lye and oils are 100 ° F or below. Insulating cold process soap helps prevent soda ash by increasing the internal temperature of soap. Click here to read more about soda ash and how to prevent it. If you choose to insulate your soap, it’s important to not let it get too hot. If cold process soap gets extremely hot, it can form “Alien Brain,” on top. Below is an example of Alien Brain; notice the wavy brain-like texture and complete gel phase throughout the soap. Alien Brain is a cosmetic issue, and does not affect the quality of the soap. If you live in a warm climate, you may never need to use a heating pad or insulate soap to promote gel phase. 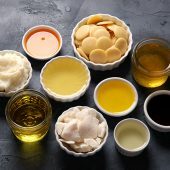 This is especially true if you choose to soap above 120 ° F. Extra warm soaping oils combined with a hot room can be enough to promote gel phase without insulation. It’s all about finding the right balance! Your mold and fragrance oil are other factors to consider when deciding to insulate your soap. Large slab and loaf molds hold on to heat better than small individual cavity molds. 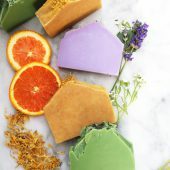 If you are using a mold with individual cavities such as the 12 Bar Round Silicone Mold or the 12 Bar Oval Silicone Mold, the soap loses temperature quickly because of the small amount of soap. Soap molds such as the 12 Bar Square Silicone Mold hold heat slightly better, because there is not as much space between the individual bars. When using these molds, I usually place the mold on a heating pad and insulate to prevent soda ash. 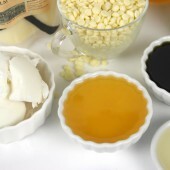 Some fragrance oils can naturally increase the temperature of freshly poured soap. In particular, fragrances containing spicy notes, such as clove or cinnamon, tend to naturally increase temperature. On the flip side, there are scenarios when insulating your soap can cause adverse effects. 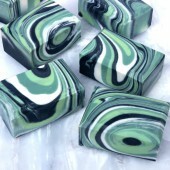 Some soap recipes do not react well to heat and should be kept as cool as possible while in the mold. Soap made with milk is an example of this. 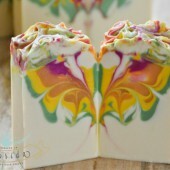 When making soap with milk, it’s important to keep temperatures low so the natural sugars in the milk do not scorch. 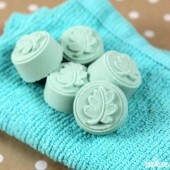 Scorched milk soap can have a mild unpleasant odor and an off-white color. 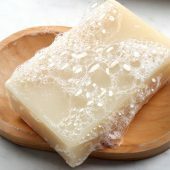 To help keep temperatures low, some soapers like to place their milk soap in the fridge or freezer for several hours immediately after pouring the soap into the mold. If you’d like to learn more about soaping with milk, check out the tutorials below. 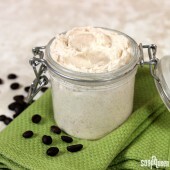 Also, learn more about mixing lye with milk in this blog post. 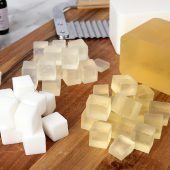 Other examples of cold process soap that may overheat include soap made with honey, juice, purees or any other ingredients that include sugar. Sugar naturally causes the temperature of soap to increase. Further promotion of heat via insulation can cause the soap to volcano, crack or alien brain. Just take a look at this soapy volcano that occurred when I created soap with coconut milk! Soap that contains melt and pour embeds or jojoba beads should also be kept fairly cool so the embeds and jojoba beads do not melt. 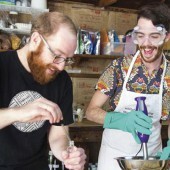 Choosing whether or not to insulate your soap is both a personal preference and a balancing act. 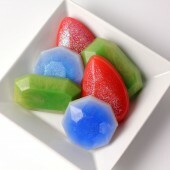 First, you should consider whether or not you want your soap to go through gel phase. If you don’t want gel phase, do not insulate your soap (but be sure to spray with lots of 99% isopropyl alcohol to prevent soda ash!). You may even want to take precautions to prevent gel phase such as placing your soap in the fridge, because gel phase can sometimes occur without insulation. If you do want to promote gel phase, consider your soaping temperature, recipe and room temperature. 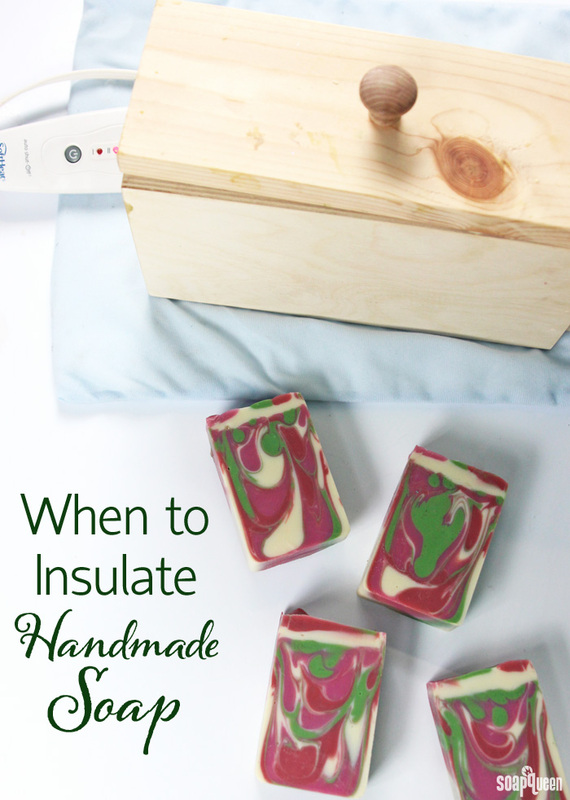 Do you insulate your soap, or not? I like to insulate just about all my recipes because I love the look of gel phase. I was wondering if you know the minimum temperature soap must be held at to promote gel-phase, and for how long. I’m asking this specifically in regards to CPOP. I know you’re supposed to set the oven at its lowest temperature–which is usually 170°F (for 1-2 hours)–but if your oven has any temperature range, what do you think is the lowest that’d promote gel phase? I have been making cold process soap for about a year and still have a few questions. 1.) I have always insulated my soap. However, I recently made soap and insulated it and it turned out with “alien brains.” From reading on here it seems to be because the soap got too hot. But I do not understand why it got too hot? I used Saran-wrap over the top so that the blankets would not fall in the soap. I also used benonite and and Lavender essential oil. Was it something I did wrong? Also I poured my lye mixture outside in the cold. Would that cause a problem? 2. 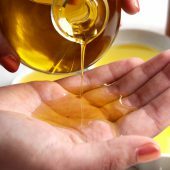 I read on the site that problems could occur if the soap was made under 100 F. My recipe says I should cool the lye mixture and oil mixture to around 80-90 F. Is that too “cold and thin?” If i use: Coconut oil, Palm oil, and olive oil, then could I stand to go up in degrees? 3. 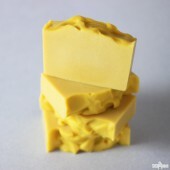 I also read on the site that some ingredients did not do well in Cold Process soap. 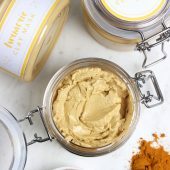 Is there a list or blog post anywhere that includes those ingredients? We like to have our lye and oils around 100-130F. 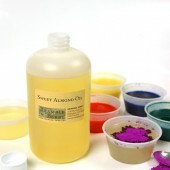 That ensures the oils stay melted and you have time to work with your design. If you find the 80-90F works for you, definitely stick to it! 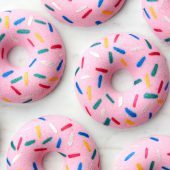 Soaping is very personal, and everyone’s methods/recipes are different. We don’t have a full list of ingredients that don’t do well in cold process soap, but we have a few posts that have more information. I’ll link them below! I have made soap twice since I asked you my questions. The next time that I made soap, I did not insulate it at all and did spray it with alcohol to avoid soda ash. However, the soap partial gelled. Partial gel happens because the soap cools to fast right? The other time that I made soap (yesterday) I used a heating pad on medium and then covered the molds lightly with a towl. I kept watch to make sure that it did not partial gel, but also did not overheat. Then I thought I should add more towls to encourage the gel and keep it from partial gelling. I looked at it several times and it looked good like the gel was spreading to the edges. However, when I came back about 30 mins later, it had a little bit of alien brain going on. When I cut it today, it had the alien brains, some partial gel, and silicone rash. Also these last two batches have had air bubbles in the middle of the bars. I’m just not sure what I am doing wrong? Yesterday I made my second-ever batch of CP soap. It was shampoo bars. I know the oils and lye mixture was only slightly above room temp in the 80s. I am an impatient person so i did the cp oven method to speed thing up. My mold was wood lined with silicone. I put the poured soap in the mold, then into a 170 degree oven for 2 hours, then turned the oven off and left it alone until the next morning. It came out nice but did have some of that wrinkling on top. I was able to unmold and cut the bars right away. Do you think it would help to use this method but turning the oven off as soon as the batch is placed inside? I’m running into a dilemma myself. 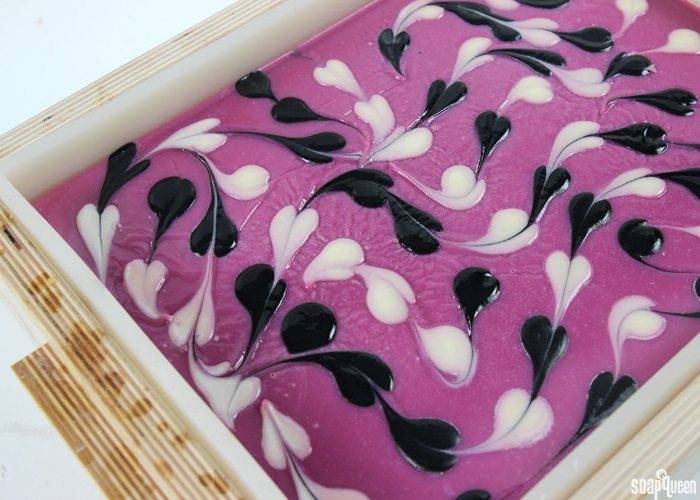 Twice now I’ve attempted to do swirl designs on the top of my soap by using drips of the previously dispersed colorants and then a chop stick to swirl. It looks gorgeous initially. I then mist the top with 91% rubbing alcohol to deter soda ash and insulate the soap with a towel. Both times the swirled top has come out with this grainy texture. 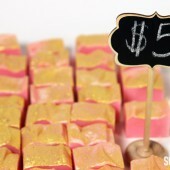 The rest of the soap is beautiful! Its quite frustrating that the top looks like sand. Any tips? ok I’ll give that a shot next time and let you know. Thanks! Hi there! I was hoping you could assist me! I just made my first batch of cold process soap 2 days ago. I used all liquid oils (with the exception of 3%) shea butter and did a 5% superfat in my recipe. 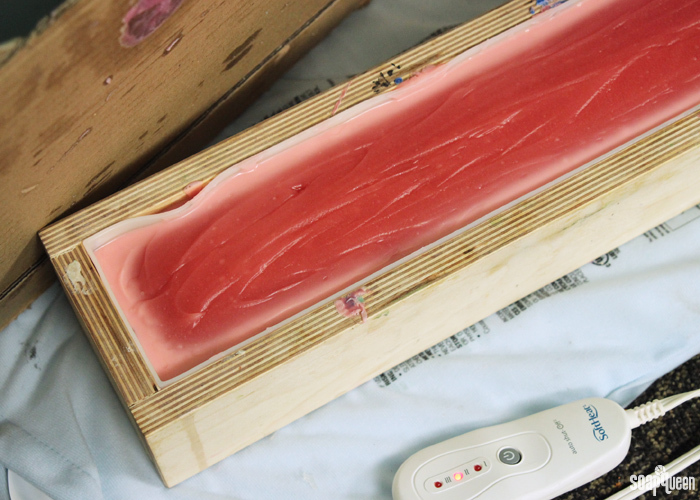 I used a wood mold with a silicone liner and I covered and wrapped it immediately to promote gel phase. It has been 2 days and my soap is still quite soft. Other than waiting a few more days to unmold, should I be doing anything different? I thought of unwrapping it and maybe putting it in the fridge or simple allowing it exposure to air? Any help would be appreciated! Thanks a mil! Hi! I am hoping you can help! I have recently been getting white spots in my soap. I have been told it is because my soap is getting too hot because I am insulating too much. This problem is purely astetics but would like to have it smooth once again 🙁 . My oils are: Coconut, palm, olive, sunflower, sweet almond, castor and shea. I normally soap at 100 and insulate well. 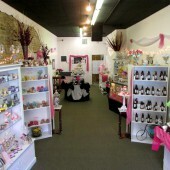 My molds are about 4″ high and is 12″ by 17″. Here are some things I have tried: cutting out shea, cutting out palm (to rule out stearic spots), soap at lower temps, insulating more, insulating less, stirring with a stick blender, stirring by hand….UGH!!!! I would really appreciate your expertise on anything else I could try? Can you help? I made two 2lb batches of CP in wooden molds and insulated them with boards and towels. One is with orange and lemon EO and the other is spearmint and eucalyptus. They both have sweet almond oil and castor oil as well as olive and coconut. But after 4 days they are still a firm gel with a pale hardened layer on top. I cannot cut them as they are too soft. Do I just leave them longer to set or are they no good? I’m new too soaping but have had success so far. This was a new recipe for me. I’m still trying to get my head around the science of gelling! Thanks. Hi, I”m wondering why exactly it’s so important to leave your CP soap in the mold for 3-4 days before un-molding and cutting? For some reason, my soap is always stable enough to remove from the silicone mold and cut into bars after as little as 12 hours (although I usually wait at least 24 hours). What are the downsides of not waiting 3-4 days to un-mold? I made the CP baby buttermilk soap. I made the soap, and put it in a spare bedroom for about 2 hours. Then I read somewhere that it is a good idea to put soaps made with milk in the freezer for 5-24 hours, so I put it in the freezer. Should the soap still be ok even if I waited to freeze it or should I have put it in immediately? Thanks! UPDATE: Well I took it out of the freezer this morning and after a few minutes it is sweating and feels a little oily. Should this evaporate in time it hasn’t even been 24 hours since I made it. Is this normal? …I don’t want to be totally disappointed because I love the concept of this soap! I hope it isn’t a scrap! Thanks! Thank you Kelsey, it is looking good! I can’t wait to cut it! , thanks for your reply! Also, could I substitute pumpkin purée in place of the carrots? Would I need to adjust anything, or just use pumpkin purée in the same amount as the carrots? Or…. Do they sell pumpkin for babies???. I haven’t looked!! 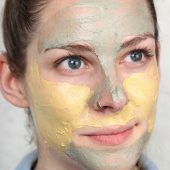 I am having trouble with testing the PH of my soaps. I have made 2 batches of hot process soap so far. I measured to a T, and followed instructions religiously. When it came to testing the ph used the drops and couldn’t get the result I needed. They stayed pretty dark in color. I decided to test all of the soap in my house, homemade and store bought. 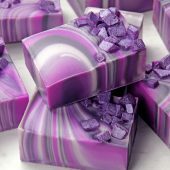 I tested all the soaps I made newer and older as well as a goat milk soap I purchased online from a reputable company, as well as some melt and pour I made. I cut each bar down through it and tested each one. They ALL stayed dark with the exception of the store bought bar. What am I doing wrong, the melt and pour as well as the one I purchased from another homemade company as well as my own ALL don’t seem to have the proper ph? I also tested them with PH tape…same results…HELP! Dark green is what you want to get! Normal soap pH is around 9-10. The 10 on the pH strips is a darker green, while the 9 is a lighter, more lime green. The 11 on the scale is a dark, grayish olive green. 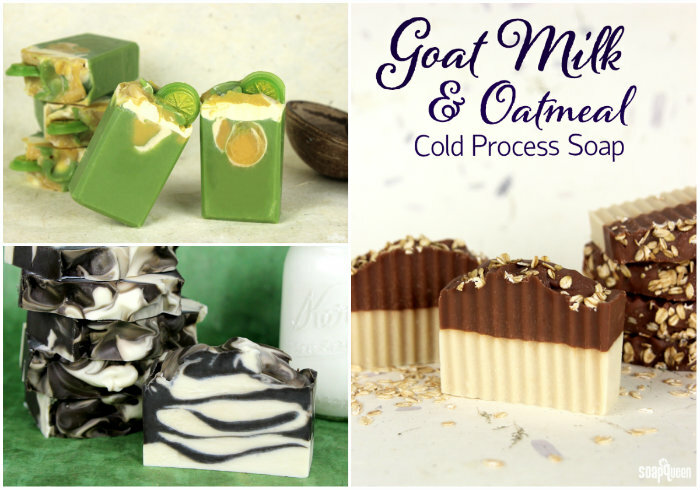 After I put the cold process goat’s milk soap in the freezer for 24hrs, what’s next? And what should I do when water comes out? Can I pour more soap above the one that’s it’s already hard and curing? It’s because a miscalculated the recipe and I want to fill up the entire mold. hello i made soap with out checking the fahrenheit and it looked like it came out okay but how long do i have to leave the soap out for ? 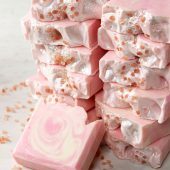 Hi, I am planning to make a soap with rose petals on top. 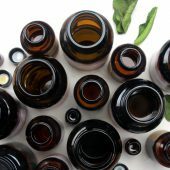 What to do about about the alcohol? Should I spray it or not (because of the flower petals) ? After removing from cooled oven, noticed a coating of tiny bubbles atop the wood mold soap, but it freed from the mold fine – no bubbles anywhere else. The heart soaps from the silicon mold were another matter – covered with tiny bubbles on top/sides/bottom, giving them the texture/look reminiscent of a kitchen sponge(!) with a few of the bars (very) slightly “volcano-ed” on top. The bars themselves are hardened enough to maintain their shape (ie, not soft/sponge-y). The bubble texture seems to be just on the superficial layer of the soap. So did the CPOP method overheat my soap? I’m guessing that the wood mold soaps are fine, but are the heart-shaped soaps usable, if slightly odd looking? In other words, is this strictly a cosmetic issue (assuming the formulations/PH is OK)? Thanks! This can also be the case with silicone liners. 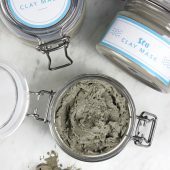 Were you using a silicone liner for the 2 pound mold? I read in your articles that the right way to prevent soda ash is to mix the lye with the oils at 120-130 deg F and cover it with blanket to promote gel phase. 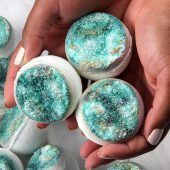 Also i read your post on how to prevent soda ash and you say to spray with isopropyl alcohol 10-15 minutes after we mold the soap…But in this condition if the soap is still warm could the alcohol destroy the upper texture surface of the soap? Also after the spray do i have to insulate my soap? Thank you Mary, glad you like the post! In the past I tried to mold a soap in a thicker trace. It was really difficult to put it on the molds and also afte some days after, there was that soda ash again!!! I may try to mix oils and lye at 120 deg F and also may promote gel phase… Could i use any alcohol instead of the isopropyl alcohol such as ethyl alcohol for example?? The good news is you can get rid of the soda ash by steaming the soap, or wiping it with an old nylon! Really thank you for the help! Hi, I made CP soap for the first time and followed one of the beginners recepe and exact amount of each ingredient. I wrapped the mold in a big towel and put it in the basement which the temperature is pretty cool. 24 hours later I took it out of the mold and tried to cut it and it broke up and wasn’t able to slice it. I’m not sure if the basement was to cold or I mixed it to thick before I put it in the mold? Any suggestions would be helpful. Thanks. Hmm, I’m wondering if the soap got a bit too hot. If the soap gets too hot, it can make the soap a bit dry and crumbly. 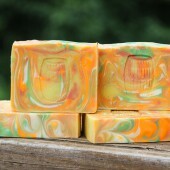 It may also be that the soap needs a few more days in the mold to be sturdy enough to cut. We usually recommend letting it sit in the mold for 3-5 days before cutting. Ok, just saw article on alien brain. Inside home in Arizona is warm enough. Thanks for all of your articles. Hope this is not a dumb question. I am just about to start CP soaping…I read about gelling, keep soap warm and covered for at least the first 24 to 48 hrs. I am in Arizona, hot here, some rooms in the house are hotter than others, I could keep the soap in there, or what about the hot garage? Temperatures here are around 110 now, garage is hotter, especially after parking hot car in there. I am sure you don’t want to raise the temp of the soap, just keep it warm…. If you find the soap isn’t gelling or only going through partial gel phase, you can cover the soap with a towel. Just check it every once in awhile to make sure it’s not getting too hot! Thanks for this great article. All books I have read suggest I insulate my soaps to go through gel phase. I personally do not like to look because I always have a semi-translucent soap in the middle and a more pale/harder soap in the borders. But living in warm climate (75-80 deg F most of the year, I no longer try to make the soaps go through gel phase; they turn out just fine and I never had an issue with soda ash showing up on top of my soap. 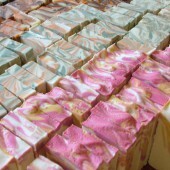 I always use only natural colorants and essential oils in my soaps. As I didn’t know much about gelling or not, I started experimenting and insulated some of my batches while placing some others in the freezer (at first I only did this with those made with milk)… and I couldn’t see the any differences in color. So I started placing all of my batches in the freezer and just left them there for 48 hours. It seems like those soaps have been turning out fine, with little soda ash, except with some cracks on the top. Aesthetic issues aside, I was wondering if I was not messing up the saponification process by doing this, or by leaving the soap in the freezer for so long . Any comments will be much appreciated. Sounds like you’ve found a perfect method for storing your soap! Loved this post. I don’t where to send my article request, so I am sending it here. 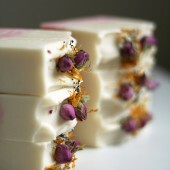 Could you do an article on how to get essential oils like Lavender or Grapefruit EO to stick in cold process soap? 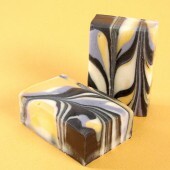 I love the scent when I use them in my soaps but after six weeks I can barely smell the fragrance. Thanks in advance. We both commented about the same thing…I noticed the exact same thing as well..and it’s because of the FO’s flash point….if we gel and the soap reaches a temp of 180, and the FO’s flashpoint is 150, then it’s going to kill the fragrance….I made several batces of soap before realizing this. You are right, Tammy.. I should have clarified that I have also tested this with various flashpoint levels, the gel soap (mine, anyways) always loses fragrance staying power – even if flashpoint is on the high end. I guess gel is just not for me or perhaps my recipe has something to do with scent retention, also. 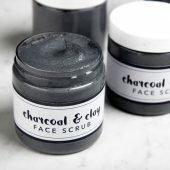 I’ve tried kaolin clay, mixing fragrance with oils prior to adding lye, adding after emulsifying, and stirring, not blending….. It’s all about testing, for sure. Thanks for the response Kelsey! 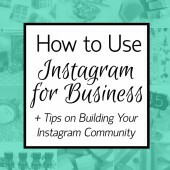 This is a great comment/advice! I’m new to soap making and I had this happen and was SO disappointed because not only did I love the fragrance I used but it was a total waste of money. I guess gel is just not for me or perhaps my recipe has something to do with scent retention, also. 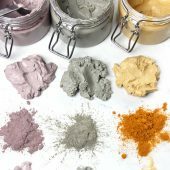 I’ve tried kaolin clay, mixing fragrance with oils prior to adding lye, adding after emulsifying, and stirring, not blending….. It’s all about testing…testing…testing.. Great post! I guess gel is just not for me, perhaps my recipe has something to do with scent retention, also. 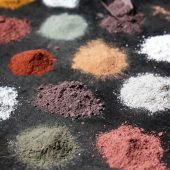 I’ve tried kaolin clay, mixing fragrance with oils prior to adding lye, adding after emulsifying, and stirring, not blending….. It’s all about testing…testing…testing.. Great post! When using milk in soap (I haven’t tried this yet) does the potential overheating problem still apply when using dried milk that has been reconstituted and added at trace? Or is it not an issue to keep it cool and from gelling with powdered soap? Thanks! I am fairly new to soap making, but I love to gel..a few times I had a hard time getting my soap to go through a full gel phase and I know a partial gel ring is not a bad thing but I do not like the look of the ring, so I started CPOP and I absolutely love it…I’ve ended up with a partial gel ring a couple of times when I CPOP, but that was only because I am super duper impatient and want to take that soap out of the oven lol. 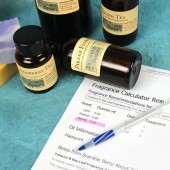 I have learned to have more patients :D…I’m happy that this article popped up on my feed because just this morning I was reading about fragrance oil flashpoints…so it got me thinking, if you gel a soap that has an FO with a flashpoint of let’s say 150 degrees..and the soap reaches 180 degrees during gel, will that make the scent of the soap fade? Should whether or not I gel depend on the flashpoint of my FO? I wish I had thought of this long before I made 20 batches of soap, which many of them have more of a faint fragrance then I would like. I too live in Arizona and I have been putting my loaves in a slightly warm oven that is turned off, light is kept on. No opening the door! Is that acceptable? With some batches, I also have noticed a line around the edges (1/4 inch from the edge) when they are first cut. It seems to fade with curing but not completely. Not all batches, but my Orange 10X soap especially seems to be “lined”. Any thoughts? I think that line on the edges is partial gel phase! The soap may be gelling only in the center, leaving that ring. To promote fully gel phase, you can up the temperature of your oven slightly, or leave it in there longer. That should get rid of that ring! I gel just about everything, I think it really does make a difference to the finished soap bar. I fortunately have not encountered any of the mishaps described. I live in Portland so there is not a lot of high humidity or temperature the majority of the time. I don’t use a heating pad, I just put my mold on a double folded towel, cover it with plastic wrap and a piece of cardboard, then flip the ends of the towel over the top of the mold. I spray with 99% alcohol several times during the first hour or two. For my bar molds I use copier paper boxes cut down to 4″ high and the lid with quilt batting in the bottom. I haven’t encountered any epic fails so far. Thanks – I really enjoy these informational posts! 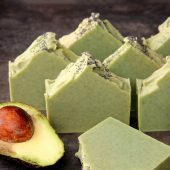 Maybe it is just me, but I dont really care one way or another if my soap has ash or brains texture, as long as it is soap and I have processed out all the lye. 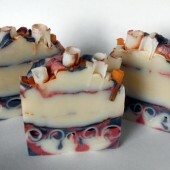 I think the nuances of non-traditional texture is a bonus in my soap. I think a gel phase that only gels a portion of the soap makes for a really cool visual feature in my soap. 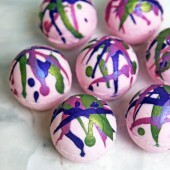 In my opinion, these are artistic bonuses in my home made soap and I enjoy the artistic ascetic of them. I like that it is a natural out come that I did not work hard to achieve. Let me add, 1) I do not sell so I am not looking for the perfect bar, 2) I don’t use fragrance, 3) I dont use colors, and 4) I use the same recipe and very rarely deviate. I keep getting those pesky little bubbles in my soap. This never used to happen. It’s happing in the pot shortly after I pour they lye into the oils. I’ve tried pouring the lye down a shaft so it does not splash and burping the hand blender. I add the lye to the oils at 100 to 102 and insulate my soap. Why is this happening? 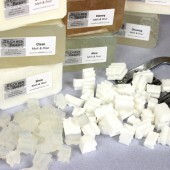 During the soaping process, your soap is getting mixed, poured, etc. 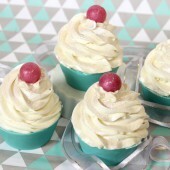 Any of those steps can be incorporating bubbles into the soap. Pouring the lye down the shaft of the stick blender and burping it is a great way to prevent them! 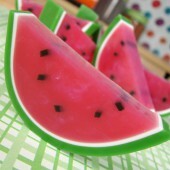 Another thing you can to is tap your mold on the counter after it’s in the mold. Give it a couple good whacks. That forces those bubbles up to the surface and pops them. Thanks for the reply Kelsey. The bubbles are happening as soon as I turn the stick blender on. I will try whacking my mold (14-inch abs pipe) I’m afraid if I whack it too hard the soap will come pouring out the bottom. The strange thing is this started happening as it never happened before. Hmm, that’s strange. It may help to mix your soap in a tall, thin container. That will keep the stick blender head fully emerged and prevent it from whipping in air bubbles. When using a tube mold, it helps to pour the soap gently down the side of the mold to prevent those bubbles. If you’re finding you’re still getting air bubbles, it may be your stick blender. 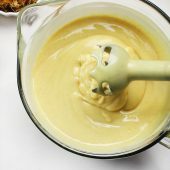 Stick blenders can start to malfunction and whip in lots of air. You may want to test it out in some water and see if you’re noticing a lot of bubbles! Thanks for bringing this up – This same condition inexplicably started happening to me last spring and I also do all of the preventative steps (burp the blender, stir very carefully, tap the bottom of the mold constantly) – I’ve even tried a new blender, changed out oils, etc. Then I spend way more time getting rid of the bubbles than I’d like to. I live in hot humid Florida, I soap at about 120, and my soaps almost always gel. I soap inside in AC. I have boxes that fit each type of mold. When done, I still spray alcohol many times, cover with Plastic wrap when set, then close the lid on the box and put on a high shelf in the laundry room. I get a little ash, even with full gel. I’m wondering if it’s humidity related?? 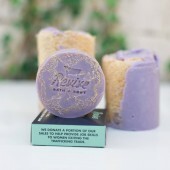 I love the box idea, because it gives the soap the perfect amount of insulation and protection. We recycled the Handmade Beauty Boxes I got for my daughter, perfect for the loaf molds!! Soda ash is fairly common in soapmaking, and can pop up even with alcohol and gel phase. To help prevent it, you can also tweak your recipe slightly! It helps to pour the soap in the mold when it’s at a thicker trace. Using a lower superfat level and water discounting can help too. I too have mixed results with getting soap to go through gel phase. I never insulate because every time I do I end up with ‘alien brains’ or badly cracked surfaces. The temperature here in NZ is quite cold and my lab is not heated but I still have big problems with soap overheating if I insulate. 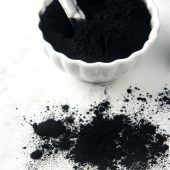 The other thing I have massive problems with is soda ash – I soap at around 120F and take all the other precautions but still always soda ash!!! 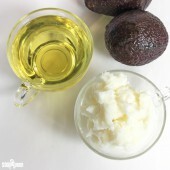 Lately I have found that if I add any butters (ie cocoa or shea) I will get soda ash but if I only use coconut oil and soft oils this doesn’t seem to happen. Weird but true! 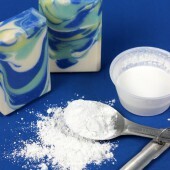 As I make lots of cupcake soaps the issue of soda ash is very important to me. Anyone else have these problems? I’d love to know I’m not the only one LOL. 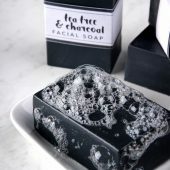 Auntie Clara’s soap blog has an interesting blog about the effects created using different percentages of water in soap. One interesting side bar to her crop circles blog is that a lower superfat and a lower water percentage result in less or no soda ash. Very worth reading. 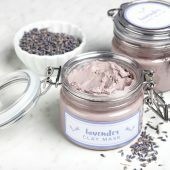 She was recently featured in the soap queen blog. I have long suspected excess water to be a culprit in the soda ash problem. She has proved it. I also usually don’t superfat as much as some people do and seem to have less soda ash trouble. Auntie Clara’s blog was well worth the reading! Thank you for bringing her to our attention. Soap is a chemical reaction between oil and lye. That reaction is called saponification. 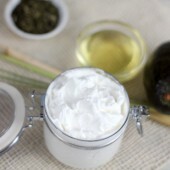 To get that chemical reaction, you pour the lye into your oils and stick blend. The stick blending helps emulsify the oil and lye and start that chemical reaction. Typically, we soap around 120F. That temperature ensures the oils all stay melted and the soap stays nice and workable for longer. 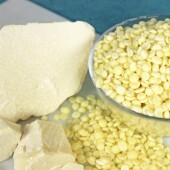 However, some soapers have their oil and lye at room temperature. Emulsification is needed for the saponification, but higher temperatures aren’t necessary. Gel phase heats the soap up. This helps those colors pop and speeds up the saponification slightly. That’s the same idea for hot process soapmaking. However, it isn’t completely necessary. Gel phase is purely aesthetic. In some cases, heating that soap up can cause it to overheat, which is why you pop that mold in the freezer. I won’t claim that I now completely understand but you definitely have helped to clarify things! Thank you very much! I gel too, unless I’m using milk, honey or some other sugar. I have a small cardboard box that I cut the flaps off of, that fits nicely over the filled mold without touching the top or sides. So I just put that over the soap, and then cover with towels too. My basement is around 67 F, so it’s pretty cool. I have had so much trouble with my soap lately that after five years I am thinking of quitting. I like gelled soap but this last winter I didn’t think my soap was gelling in a silicone mold which I love. So I put it in the oven with just the light on. Then I was getting partial gel. So I put it on a heating pad covered with a box covered with a blanket. I guess I cooked it because I left the heating pad on all night. The colors and texture are gross! How can I have made such great soap for so long now I get junk?! It’s all about balance and finding your perfect temperatures! We’ve found what works for us is to cover the soap with a piece of cardboard and a towel. If it’s colder in our Soap Lab, we put it on a heating pad for about 20 minutes. We don’t recommend having that heating pad on for more than an hour, otherwise it can do weird things to your soap! As a Asian Soapmaker living in warm (well may consider hot and humid climate) I never insulate my soaps. They, yes, go through gel phase but not many of them can get fully gel phase just about 50 – 80% gel phase that make the soap not the same at all. Anyway, the last time I tried to insulate my soap, that batch got a bad Alien Brains. I’ve been soaping for 5 years now and still struggle with this particlar issue. Half the time I’m not even sure if my soap has gelled or not! 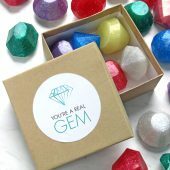 One adverse reaction that was not mentioned in this post was the crackling or glycerin “rivers” that you can get, l especially when using titanium dioxide as a colorant. 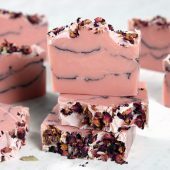 I find that if I am making soap with a white portion colored with TD, especially one with a floral fragrance, that I WILL get crackling with my recipe unless I keep temps below 100 degrees and then refrigerate or freeze the soap. 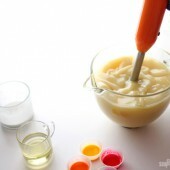 (I use silicone lined wood molds or plain silicone). Trying to get consistent results in the face of so many variables is the most challenging aspect of cold process soaping! I like to put my loaves in my “Coleman Party Stacker” insulated picnic carrier. They turn out great. I like to put my soaps in the fridge wrapped in a towel. I live in Arizona, so it’s definitely a much warmer climate than normal. 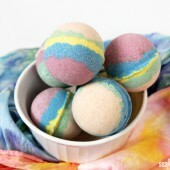 The colors are still beautiful & I don’t have to worry about the soap overheating or the fragrance dissipating.